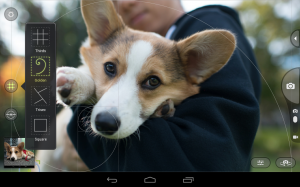 The Smugmug’s Camera Awesome is finally available on the Play Store for $2.99. It has been a long time favorite app on iOS and after some time in beta on Android, today is available to all. If you’re looking for a new, full-featured camera app, this is a pretty good purchase for $3. Camera Awesome works on Samsung Galaxy SIII, S4, Galaxy Nexus, Note 2, Note 3, Nexus 4, Nexus 7, Nexus 10, (Nexus 5 coming soon), Sony Xperia Z, HTC One, MotoX, Motorola Droid Razr, Kindle Fire HDX 7″ and 8.9″. You can purchase the app on the Play Store.